I know that Thursday is pie day, and I am sorry to break this tradition, but with the sun shining so brightly today fish had to be on the menu. This is a Mediterranean inspired dish which uses plenty of black olives to pack a punch. 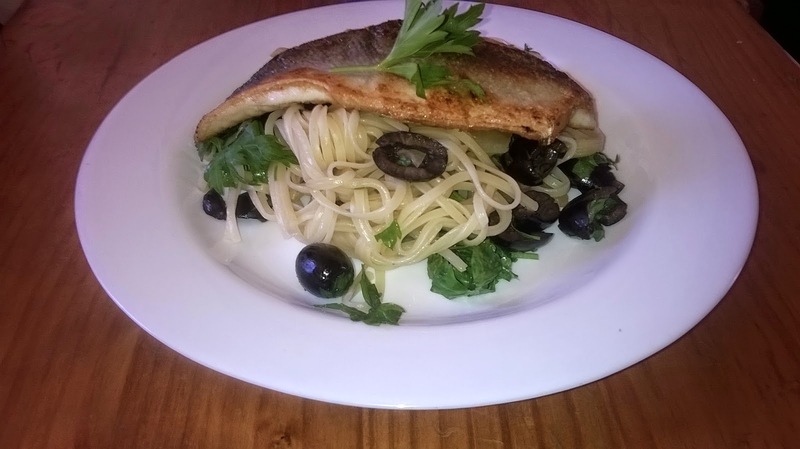 I love the mix of pasta and fish – I know some people aren’t keen but I think it works really well in this dish, so please do try it out. The whole dish is ready in under 20 minutes, so is perfect when you don’t want to spend the whole of a lovely summer evening in front of the oven. Enjoy with a glass of white; best eaten al fresco. (The recipe below makes enough linguine for 4 portions – we used the remainder for lunch the next day. Just increase the amount of fish fillets if you have more people; you’ll want one each). 1. Put a large pan of water on to heat, and when it’s boiling add the linguine. Cook according to packet instructions. 2. Meanwhile, in a frying pan, heat two tablespoons of the olive oil over a medium heat. Chop the onion and add it to the oil, then tip in the (drained) olives. Cook for 2-3 minutes, then tip in the sherry. 3. Allow the sherry to boil down, whilst crushing the olives with your wooden spoon to break them up a little. 4. When the linguine is cooked, drain it and then tip in the olive mix. Chop the parsley and add that too – mix well. 5. Dust your sea bass fillets with a little salt and a thin layer of flour. Heat the remaining oil in a frying pan until sizzling and add your fish. Depending on the size of your fillets, you’ll need to cook them for about 3 minutes skin side down, then 1 minute flesh side down. 6. Serve a fillet of fish on top of a good helping of the linguine.